MasteringMeteorology should only be purchased when required by an instructor. 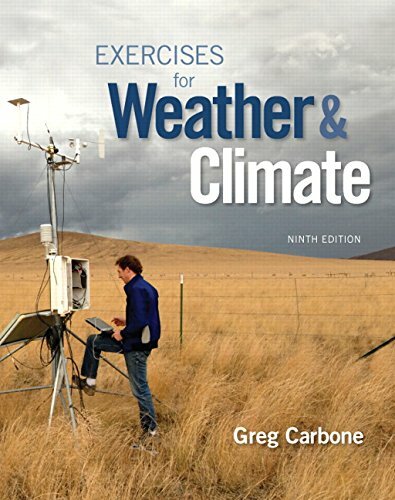 Exercises for Weather & Climate encourages readers to review important ideas and concepts of meteorology through problem solving, simulations, and guided thinking. Available for use standalone or with Pearson’s introductory meteorology textbooks, the graphics program and computer-based simulations and tutorials help readers grasp key meteorology concepts. Now with integrated links to mobile-enabled Pre-Lab Videos, and assignable Pre- and Post-Lab quizzes in MasteringMeteorology, this manual and technology program is designed to complement any introductory meteorology or weather and climate course. MasteringMeteorology is an online homework, tutorial, and assessment product designed to improve results by helping students quickly master meteorology concepts. Readers benefit from self-paced tutorials that feature immediate wrong-answer feedback and hints that emulate the office-hour experience to help readers stay on track. With a wide range of interactive, engaging, and assignable activities, students are encouraged to actively learn and retain tough course concepts.